Nose: Waxy peels, marmalade and Christmas-y clove warmth. Vanilla, raisin and a touch of dark chocolate. Palate: Christmas spice up front, joined by fresh lemon, chewy barley, almonds and a little old oak. Finish: Long, with a good balance of sweet citrus and oak spices. I find it hard to believe it’s three years since the Glenfiddich ‘Cask Collection’ first appeared as a Travel Retail exclusive in 2013. It doesn’t feel that long. Perhaps it took me a while to notice because I’m not a huge fan of Glenfiddich. I feel they are more Ford than Ferrari, with a focus on mass production rather than high quality. The standard 12yo is OK but that’s about it, it’s just OK. If their Cask Collection had set the whisky world alight in 2013 I might have pounced on a bottle sooner but it didn’t. Ratings for the entry level ‘Select Cask’ are what you’d expect for a non-age statement 1 litre bottle for £40. 79.31/100 on Whiskybase suggests the Select Cask is good but nothing special. Comments online are a bit more generous than in the Whisky Bible including “very sweet but still spicy, at the end rather short but still all right.” And “it’s light and very drinkable”. 81.6/100 on Whiskybase is a good mark but not outstanding. Comments include “this is a good sherry whisky. Dark fruits, a spicy sweetness and well balanced. Good whisky for the money, nice.” Dramlicious score the Tayne 84/100 and their review and tasting notes can be found here. Try as I might, I can’t find the name of the next whisky to be added to the ‘Legends Collection’ but I bet it will be more expensive (but still a non-age statement). By the time we get to the 3rd of 4th release in the collection I imagine it will be closing in on £150-£200. All part of the cunning plan to get collectors hooked so they feel compelled to shell out a fortune for the final releases. I think I’ll pass but I’m glad to see a solid 83.6/100 for this single malt on Whiskybase. And it’s 100cl so there’s more to enjoy. My return to Gatwick airport sees me in the mood for a Glenmorangie or two. The Dornoch claims to be a limited release but if it’s anything like the Glenmorangie 18yo ‘Extremely Rare’ I expect to see this bottle all over the world for several years to come. Whiskybase list the availability of this whisky in 9 shops across Germany, Holland and Austria as well as lots of airports around the UK. To quote the box – “in celebration of the Glenmorangie distillery’s unique location, a donation from every bottle will be given to the Marine Conservation Society for the protection of the Dornoch Firth” hence of name of this whisky (the distillery overlooks the firth). It’s always nice to know that my purchase has gone towards helping nature. 94/100 in the Whisky Bible classifies the Dornoch as a “superstar whisky that gives us all a reason to live”. The author says about the taste “even on delivery the malt arrives on all levels and in different hues, ranging from sweet and fresh to a duller, oak-dried digestive biscuit – but quite tightly bound” and he concludes with “a real treat”. A 1 litre Johnnie Walker on sale for £25 with the word ‘spice’ in the title – YES PLEASE! 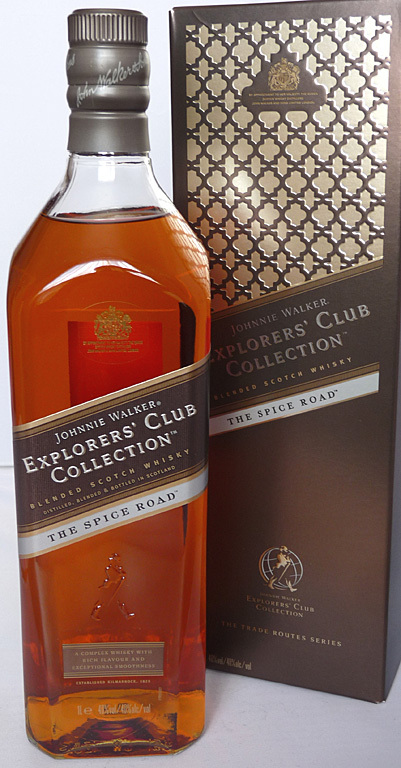 This bottle is the cheapest of the JW ‘Explorer Club’ series that Diageo have put together for Travel Retail shops in airports. Apparently Diageo were successfully sued by the real Explorer Club for using their name – ooops! But there were no hard feelings as Diageo have now become a corporate sponsor of the club. One small boo-boo by Diageo, one giant cheque for explorer-kind. 77/100 on Whiskybase is a so-so score for a blend but Jim Murray’s 84.5/100 in his Whisky Bible classifies this JW as “good whisky worth buying”. Mr Murray’s whole review consists of “sublime delivery of exceptionally intense juiciness: in fact probably the juiciest blend released this year. But the bitter, fuzzy finish reveals certain casks haven’t helped.” As noted before, several of the JW range have a problem with their finish. More reason to get quickly to the next sip! This Kilchoman is a Travel Retail exclusive, which usually means it’s available outside of the UK and several places within. This doesn’t appear to be the case with the ‘Coull Point’, which I first saw in UK airports in 2014. I spoke to an employee at the ‘World of Whisky’ shop in Gatwick airport who said his company had bought up all the stock. Since Kilchoman is a small distillery, I believe him. The Whisky Barrel in the UK is trying to sell it for £200 but they clearly got their stock from the airports where it’s only £50. A £150 mark-up?! Seriously?! You can buy bottles at auction for around £50-£60. 84.5/100 on Whiskybase is an excellent mark. It seems hard to dislike Kilchoman. The distillery is probably the best success story in the whisky world in recent years. Comments from Whiskybase members include “nice whisky”, “a very active, young interesting thing with a character of its own and a lot of potential” and “one of Kilchoman’s most successful presentations to date”. 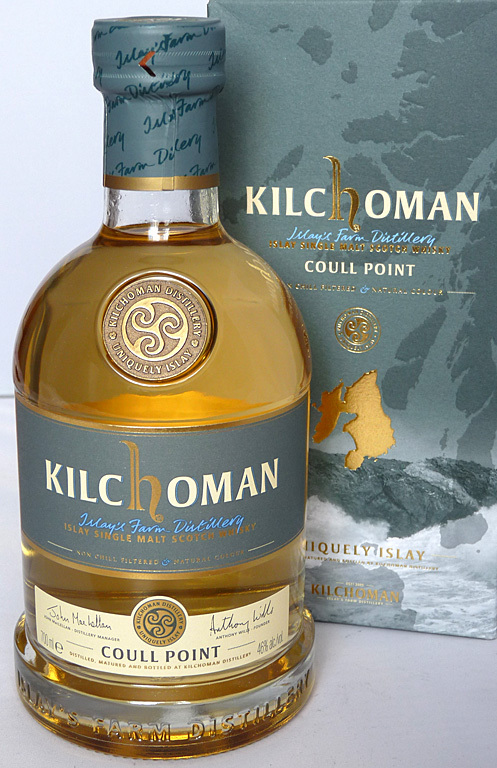 If you can find the Kilchoman ‘Coull Point’ at an airport for £50 I’d recommend getting a bottle. Not only is it good to drink but also it has potential as an investment. Before I go to an airport I like to plan in advance what whisky I’m interested in. This might work if ‘World Duty Free’ list all their available whisky online but they don’t. When I got to Gatwick airport I discovered several new spirits including this Bowmore. It was also reduced to £40, which seemed very reasonable for a 1ltr bottle. I quite like the subtle Islay flavours of Bowmore so I decided to take the plunge and buy a bottle, even if it was obviously riddled with caramel colourant. Scoring 87.5/100 in Jim Murray’s Whisky Bible classifies the Black Rock as “very good to excellent whisky definitely worth buying”. He describes it as a friendly, full-bodied dram with smoked toasted fudge as the main theme with a vague backdrop of cinnamon and marmalade. He summarises with “if you are looking for a gentle giant, they don’t come more wimpish than this”. Yes, I know, I’m an idiot. 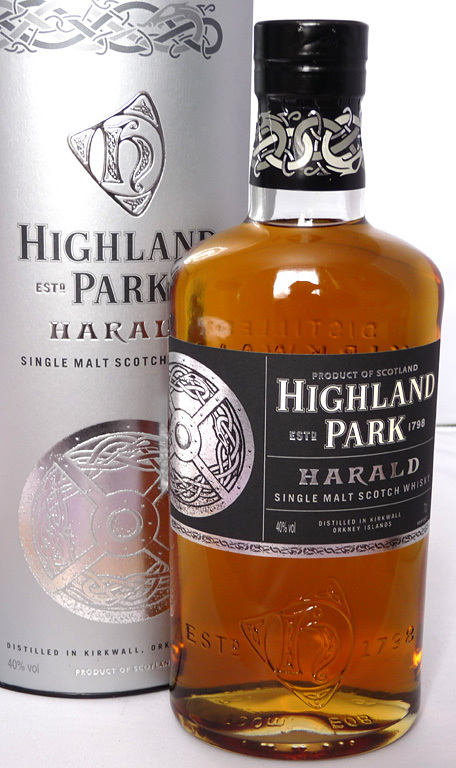 But, when you’re a fan of Highland Park, you sometimes have to let your heart rule your head. If, like me, the Whisky Bible is your first reference point to see how good a whisky is, you’d never buy the ‘Harald’. 74.5/100 means “usually drinkable but don’t expect the earth to move” which might not sound too damning until you combine it with the Harald being £70. Unlike the cheaper Svein and Einar, it’s not even 100cl! Jim Murray, author of the Whisky Bible, says of the Harald “Warrior Harald has been wounded by sulphur. Fatally”. Aaah, the penny drops! As I’ve noticed before, Jim Murray has a very high sensitivity to sulphur. So high in fact that it’s like a human being able to hear a dog whistle. I decided to hunt high and low on the internet for other Harald reviews to see if anyone else mentioned “sulphur”. Guess what? Not a single one. So, please take the Whisky Bible rating with a pinch of salt, or sulphur if you prefer. The Malt Maniacs have the Warrior Series scores as – Harald (83/100), Einar (82/100) and Svein (81/100) which is exactly how they’re priced from highest to lowest. It’s a little bit different on Whiskybase but the Harald still comes out on top with 81.6/100, Svein is second with 81.45/100 and Einar rolling in third with 80.8/100. The Whisky Bible has them in reverse with Einar scoring 90.5/100, Svein gets 87/100 and then the lowly 74.5/100 for Harald. This is one of the reasons why my blog is a casual, almost a personal record of my collection, rather than my thoughts about the taste of whisky. I’ll let you draw your own conclusions about reviews but, I find that they’re so personal; it’s almost pointless reading someone’s opinion. Nevertheless, people still find them interesting, so I’ll continue to include them. Heck, I find them interesting! I enjoy watching Masterchef and hear them describe meals I’ll never, ever taste. At least with most whiskies, there’s always a chance of finding a sip of the bottle you’re reading about.